Are you F! @#&^g serious, we have gone to the dogs!!!!!!!!!!!!!!!!!! Maybe get zane to go up there and tell them we don’t want dawgs in Bermuda? When the Moors went in Europe to enhance their culture, one of the things the Moors taught them is animals belong outside. OMG – Wakanda Royalty and now dogs at SP!! What next – A Flat Earth Convention??? Well this government has gone to de dogs, so why not have them join in to society, meeeouch!!!! I hope that people will be told what rooms have had dogs staying in them, like they do with smoking and non-smoking. I know people are crazy about their dogs but they smell-even if they don’t smell to you; you become ‘nose-blind’ as Febreeze says. Plus, there are people who have allergies and are affected by dogs. If I go into a space where a dog has been, I sneeze like crazy and my chest starts tightening up and if I don’t get out of there I have a full-fledged asthma attack. Yes, I have an aversion to dogs and it could be because my body senses they are a threat to my health but I’m not posting this to be mean. This could really make someone sick. No, that’s a valid concern, you may want to send that to the SouthP folks because I agree, last thing a guest wants is to experience that kind of exposure that they’re not expecting. Your concern was probably the first thing we addressed in planning this. Thank you for looking out though. So you’re going to have dog and non-dog rooms because I wouldn’t want to stay in a room that’s had a dog in it and if someone with a severe allergy goes into anaphylactic shock from breathing in dog dander, you might have a major problem on your hands there. Personally, I find that really disgusting but anyway, I’ve said my piece. Read their response! People like you complain about everything from pollen to mold! It’s an island and dogs are people too! If you come down with an attack then deal with it! You aren’t going to be able to sue anyone as you sign the register like everyone else assuming all liabilities! Catch up with the rest of us! My first thought was flea control, as there are many areas with carpet throughout the hotel. Not everyone keeps on top of their flea control, and an infestation would be a disaster. Good grief guys do you think SP would not think it through a little? We (Bermuda) used to have a little winter niche with dog shows attended by East Coasters. They used to stay in the smaller guest houses that are rare now. It might be cool to see this redeveloped. It’s not a matter of SP not thinking it through, it’s a matter of it being properly policed. Lets face it, not all people are responsible pet owners. I’ve personally been to people’s homes (through my line of work), and left with my ankles covered in flea bites. Well I don’t know who you hang out with but I am pretty sure that people who travel with their dogs are not going to let their little puppies get fleas…just a hunch of course you might be right. I said through my line of work, not people I hang out with. My employment takes me into various homes, I don’t know these people from Adam. I have been bitten by fleas in homes with dogs. I just hope that SP took that into consideration is all I’m saying. OMG, the sheer ignorance, arrogance and stupidity of some people!! 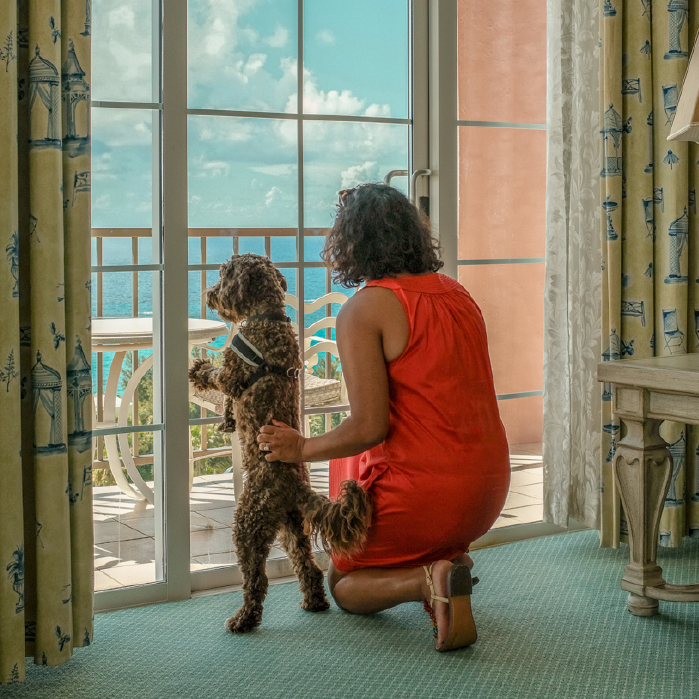 Bermuda is one of the most dog-unfriendly places! Can’t even take your well behaved dog onto a beach! Very sad. Resulting in many unsocialised dogs. Well done to the Princess. Presumably special allocated rooms not used by non-doggy persons. The irresponsible people spoil it for everyone. I saw a woman with a very young puppy allow it to poo right in the middle of a field during a football match. She let him do his business, then walked away. Then prosecute her. Most who got to the trouble of walking their dogs are law abiding. In fact they appreciate that if your male dog comes across dog waste they’ll likely roll in it! So we pick up. Should have a few beaches open, even if at certain, non-peak time and restrictions such as dogs on leads. Spent the day at Clearwater beach a while back and a couple of ladies was walking their dogs (the smallest wasn’t on a leash) on the beach on early Sunday morning. The ladies stopped to let their dogs do their “business” on the beach sand then proceeded to walk away. I called out to the lady closest to me telling her they need to clean up after their dogs, she gave a dirty look then walked over to the other lady who in turn also gave me a dirty look. The 2nd lady walked over & simply kicked sand over the mess piles & said: “The tide will wash it away”. Later I decide to take a walk out Coopers island & found more presents left behind but on my return back to the beach there was now a family on the beach with their kids playing in the sand. Luckily I was able to warn them before one of the young kids found the “buried treasure” left behind. I have also seen a woman get upset that her purse-sized dog wasn’t allowed into a restaurant and make a big scene of it. Before she was denied entry the little dog was already consistently barking and trying to climb out of her purse that she had rested on the floor. So it was obvious the dog was going to be a disturbance to the other people trying to enjoy their meals. I feel trails, parks, fields, docks, etc. are fine for dogs but some places should just be off limits. Even if you pick up the solid waste off the beach the filth of bacteria, etc. is still present on the sand that could affect others that come afterward & not everyone wants to deal with other peoples pets when they trying to enjoy their meals. Some people carry allergies & shouldn’t have to suffer during their visits to certain places, hotels being one. The dogs aren’t to blame in either of those cases. I see tons of trash on the beach every time I go – I don’t think its the beer cans that are to blame its the ignorant people leaving them. Place your anger at bad dog owners not the dogs themselves. That’s not the point. We all get that dogs will be dogs, but as I’ve already said, some of the owners are irresponsible. To some of you, dogs are your family, but to others they’re a hazard. You can’t get mad at people for having concerns. Cool move by South P and I hope a few bars/restaurants follow suit on their patios. Why should they? Why do people have to take their animals everywhere? They ‘should’ because there is a segment of the island that would enjoy it and it has proven to be a success marketing tool in other places in the world. People don’t “have to bring their animals everywhere” just like people don’t “have to” go to restaurants, bars, or hotels. My point is simply it would be nice to have a few places where dogs were welcome because there is at least a good chunk of people on the island that would enjoy it. If I go to a restaurant and they allow dogs in there, I will not be back. I know it can’t happen now with health regulations and I pray it stays that way. I don’t want to see a dog while I’m trying to eat my meal-whether the dog be inside or outside on a patio. Start your own dog restaurant with permission from the Dept. of Health where you can eat and a plate can also be set for the dog and I’ll bet some people will go nuts for it because they’re into that kind a thing. There are a few restaurants that allow dogs on their patios now – so you’re incorrect about health regulations that you “pray” stays the same (because God surely cares right). to be clear, we’re not talking about weird niche ‘dog restaurants.’ In a good part of the world allowing dogs on patios is very normal – at normal bars and restaurants and has proven to be good for business. If they lose one dog-phobic patron for 4-5 dog lovers, that’s a good trade off. Maybe it’s the excess drool and the bad smell for starters. Maybe you can get someone to help you with that, Annie? You all are hilarious, if you ever could see what humans are doing in those rooms you would never set foot in another hotel, carry a black light next time you do. I give you 10 out of ten or A+ for that one ! WOW – what strange reactions from people – why this apparent hatred of dogs? Chances are people who are prepared to spend the money to bring their pet on holiday will also make sure its flea free (easily done these days) and clean. Well done Fairmont Southampton for recognizing a market that has existed in other countries for years. Oh get over it people! Most high end hotels around the world accept pets, so what’s the problem? Of course the hotel will ensure that the room is given extra care at the end of a stay if there was a dog and they do collect extra deposit just in case to help offset the cleaning. I wonder how one would react if it were a guide or therapy dog? Typical knee-jerk negative response from people who just look for something to complain about…. While many people would welcome this development, my husband has serious pet allergies that are triggered by being around or in an area where pets have been, e.g. carpets. This causes the same runny nose, watery eyes, coughing and sneezing that a bad cold does and is pure misery. To allow pets in hotels and airplanes should be controlled and contained to certain areas so we all don’t have to suffer for it. The last hotel we were at had a yapper. Either controlled pets in a section, or we will never go back to SP again. Sorry, but the experience is not worth the money for a room. Awww so sorry for your poor sickly husband! Go stay at a motel 6 with the cockroaches then! Here are a few questions… everyone having a fit about this and screaming about the rooms etc… When you travel abroad and stay at a hotel do you 1) Ask if they accept dogs? 2) Ask if a dog has stayed in your room? 3) Have you died from being in the same room as a dog? You lot are insane. You are probably less likely to become sick staying in a room after a dog than some other human… especially a child. I believe the South P will have thought this through thoroughly and have all their bases covered. Last question…. of those complaining…. how many times a year do you stay at the South P? I actually stay at various hotels at least twice a year. That’s not even the point though. Just because you love dogs so much doesn’t mean the rest of us have to. And some people have serious allergies, why should they have to suffer just because you can’t be separated from an ANIMAL for a few days?!! I bet you drown yourself in perfume, because you can’t be bothered, or are too low class to wash properly. Gross. Why are certain people so obsessed with dogs? They are dirty and do not need to go everywhere with you. I guess Fairmont does not care about those of us with allergies! I will never visit or stay there ever again. How often did you stay there currently? Awww take your business elsewhere! No one cares what you think and it’s people like you who try to keep the rest of us from embracing change. Go hug a cat!